There's been some buzz on Hyperscale and ARC recently about the sites' search features. Apparently they're not working as advertised, which I suspect can be attributed to a bug in the software used to host the sites or a bad configuration setting deep in the network somewhere. I’m sure it will be fixed in time, but there’s a very easy and effective way to search your favorite forum or web site that doesn’t force you to rely on a web site’s search algorithm, which can sometimes be hit or miss. To begin, you need to know the URL of the site you intend to search. It’s that long, sometimes convoluted string of text at the top of your browser window. It looks something like this. The key component of the URL is what precedes the .com or .net, what’s known as the domain name. In the example above, which shows the News section of Armorama, the domain name is armorama.com. What follows the .com is just the more discrete address to the News section. 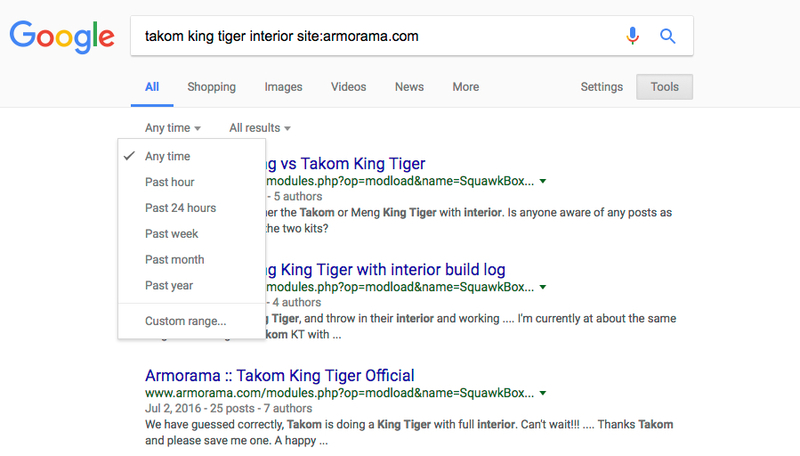 If you want to search Armorama, Google is your friend, as they say. That minimalistic search box that you've seen on their home page is all you need. Simply write a search query that's composed of two components. The first component consists of the key words you want to search. For example, if you’re looking for information about the Takom King Tiger, those three words are probably your best bet. If you are looking for information about King Tigers in general, you’ll probably use just the words King Tiger. The second component is the domain name of the site you want to search. In our example, that’s armorama.com, but you want to put the word site: in front of it (including the colon), which tells Google, "Hey Google! I want you to look for these word only within this web site. Nowhere else!" What you wind up with is a search phrase that looks like this. The search results on submitting the search look like this. It’s that easy…for the most part. 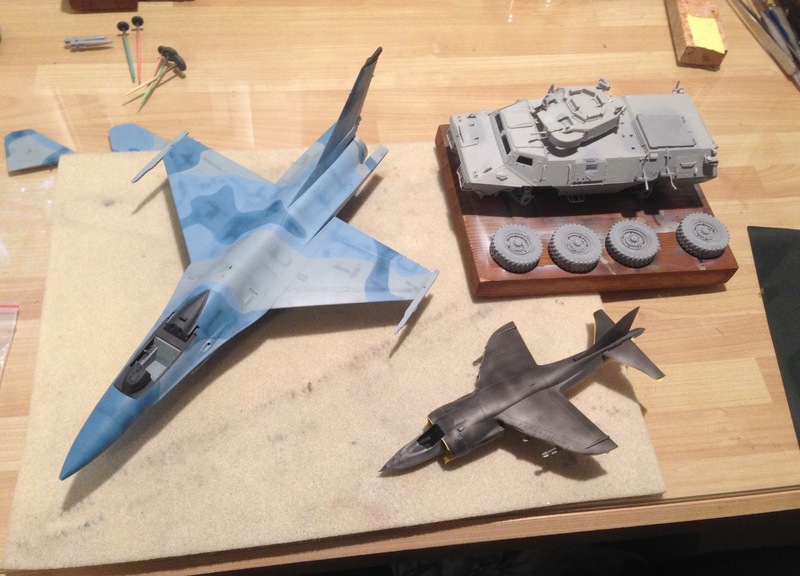 Here are a few tips from my experience as a software manager in my day job and as a scale modeler who enjoys searching the web. Google does a good job of displaying what it believes to be the most relevant search results at the top, but if your search returns too many hits, you can narrow the results several ways. Just add more search terms. 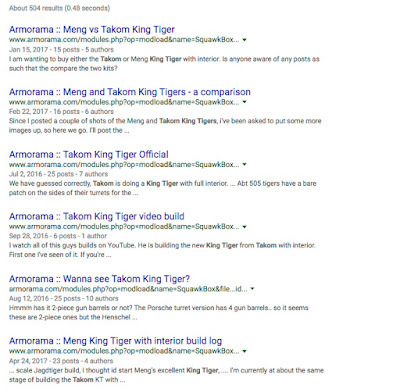 When I searched for takom king tiger site:armorama.com, you see that I got 504 results. 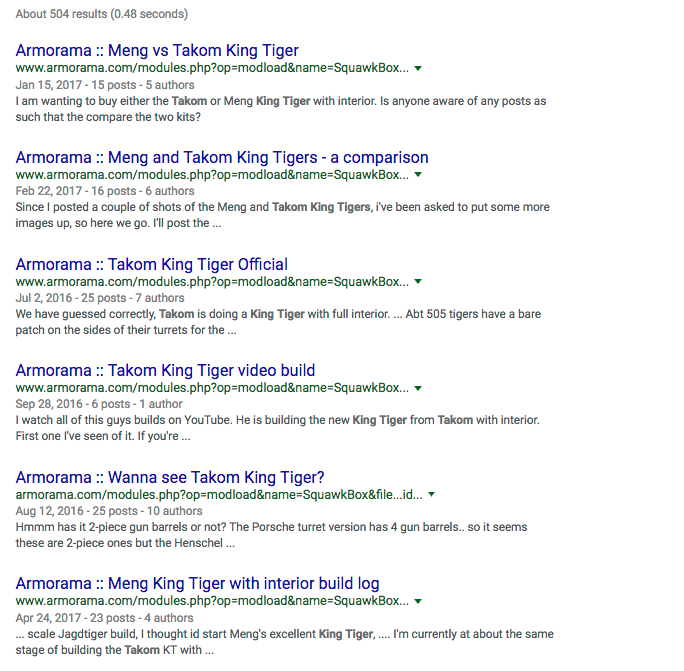 If your interest is specifically in the interior that Takom provides, add the term interior to the search words. That reduced my search results down to 222 pages. Use quotation marks. When you put a search phrase in quotation marks, Google will look for that precise string of words. 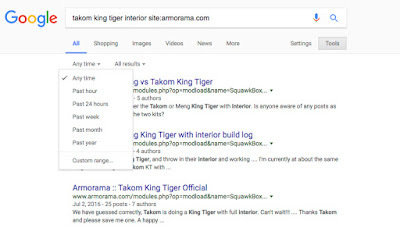 For example, if I search “takom king tiger” site:armorama.com Google will give me only pages with that specific phrase. It won’t return articles about the Dragon King Tiger, unless that model happens to be mentioned on a page where the phase Takom King Tiger is found. Google lets you refine a search by date, displaying only those web pages that were created or updated within a specified period of time. From the search results, click the Tools item and then select the date range you want to use, or enter your own using the Custom Range option. Maybe you’re searching for information about the King Tiger and seeing too many articles about the Takom kit. You can exclude pages from your search results that contain the word Takom by putting a hyphen (the minus sign) in front of the word you want to exclude. There are additional ways to restrict your search. You can learn about them on Google's support site, or you can use Google’s own Advanced Search page if you don't want to commit these specialized strategies to memory. A brief note about searching scale modeling web sites, and particularly discussion forums. Like scale modeling itself, searching is a skill that takes trial and error to give you the confidence that you’re getting the information you seek. There’s an incredible amount of information out there that’s literally at your fingertips. Go get it!